How does one rename files on the Jolla? If you have developer mode enabled - just open the terminal and use "mv" command to rename your files. On the other hand I suppose you are not using developer mode, so use your file manager of choice. Download "Cargo-dock" from store - it has "rename" function. Actually, I am using developer mode, but it seems obvious to me that renaming/moving/copying a file is such a fundamental feature that it must be supported in the default GUI. Thanks for the Cargo-dock tip, though! I overlooked it since the name did not indicate anything to do with files. Rename a file is absolutelly basic functionality, which shuld not need developer mode! As workarround you can use an alternative file browser from Yandex store, for example "ES File Explorer"
For user files: Connect the Jolla to your PC (via USB) and use the file browser of your PC. 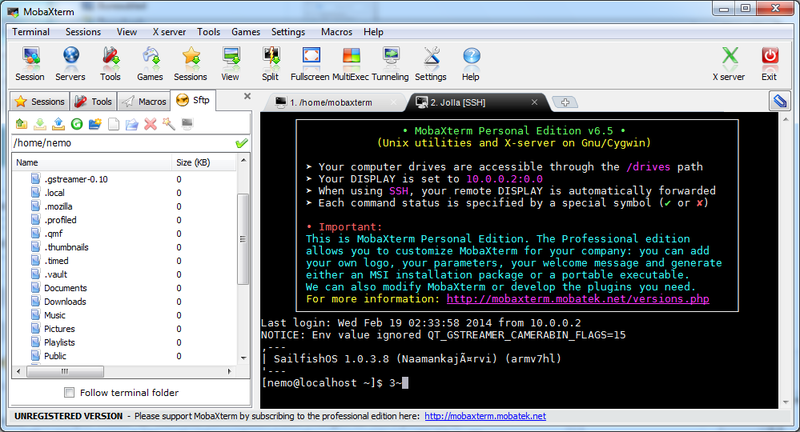 You could even use something like mobaXterm which is an Xserver/ssh/sftp-program. Works very well. If you log in it automatically displays the filemanager-window (sftp/ftp) alongside the terminal. Very convenient. This works great over wifi (don't forget to prolong screen-saver time otherwise it'll loose connection though).